Being the biggest resort area in all of Fuerteventura there are plenty of different types of accommodation in Corralejo, including villas. These are self-catering accommodations that offer a feel of being at home and privacy while on holiday. Such a type of accommodation will begin at a rate of about 200 Euros for one bedroom villas, and 500 Euros and upwards for bigger ones. Most villas require a minimum stay of 1 week. Very few of these allow pets. And these are self-catering accommodations and come with fitted kitchens. Villas in Corralejo are sometimes fully booked for months in advance, so it is important to begin looking and make a booking as soon as possible. There are plenty of villa options from which to choose. For golf fans there are villas available on the Elba Golf Course. These are 4 bedroom houses with their own private heated swimming pools. The house includes a fitted kitchen, a lounge and 1 bathroom. In the environmentally protected area of Parque Natural there are 3 bedroom villas that sleep 6 people. 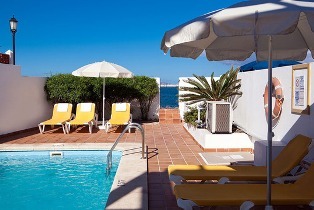 Features of this accommodation include Wifi, a heated pool, a Jacuzzi and a barbecue on the terrace roof. The nearest beach is 2km away. The rate for these villas is GBP90 per night, that is GBP745 to GBP1195 per week. However, because of the location of these villas it is advised to have a rental car. Standard villas are two bedrooms (sleeping 4), 1 bathroom, and a heated pool. These include San Juan, Ana, Pino Casitas, Lucia. These are GBP690 per week and up. 3 bedroom villas in Corralejo include Silvia, Lara, and Bellavista. Such villas range in price from GBP605 to GBP1299. The differing rates in the prices in the villas are usually determined by the time of the year. For example, during the peak seasons of December, June, July and August you can expect to pay over GBP1000 per week for a 3 bedroom villa. If you go during the off-peak season, such as January to May, you can get these at very reasonable prices. Villas in Corralejo are available for rent privately through the owners. And there are also agents who specialise in assisting clients to find suitable holiday accommodation. These include Solmar Villas Agency. The specialise in villas and apartments in particular, and not traditional hotels and resorts. They list excellent villas, including the Villa Brisas Del Mar. This is a 3 bedroom villa that sleeps 6 people. In the low season it costs GBP799 per week, and in the high season it is GBP1299 per week. It is a detached villa centrally located close to restaurants, shops and the beaches. The same Villa Brisas Del Mar also has 2 bedroom accommodations. Some of the more luxurious villas the offer include the sea front Alcorde Suites. These have 2 bedrooms, but sleep 6 people. During the busy season the rate is 450Euros and 390Euros during the slow season. The villa includes free Wifi, a sauna and also close to shops and restaurants.